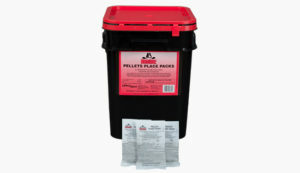 Hombre Pellets Place Packs work best in locations where bait needs to be protected from manure contamination or moisture until the rodents find and consume it. The pre-measured amount of rodenticide reduces wasted bait for maximum economic savings. Allows proper placement in hard-to-reach baiting locations such as under floor slates. Special place pack film keeps pellets fresh until consumed by rodents. Hombre Pellets Place Packs eliminates user exposure during placement.